I guarantee that this summer salad will rock your world. 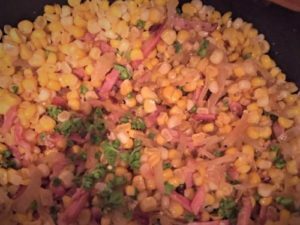 Last weekend we had too much corn on the cob (if you can imagine) and some leftover ham. A glance over my shoulder at the fresh basil in the garden and I was inspired. We had it as a side, but it would make a fabulous light lunch or a delicious snack for the kids. Shuck corn and cut kernels from the cob. Saute onion in a frying pan on medium heat. Add ham and cook until heated through. Throw in the corn, crushed red peppers and salt and pepper to taste. Remove from heat and add the basil. Serve it warm or cold. It’s the perfect accompaniment for grilled chicken. We asked Heather Burns, The Zweben Team expert for all things beer and proprietor at St. Gambrinus Beer Shoppe in Brooklyn, NY, what she recommended for our scrumptious corn salad. She suggested Prairie Flare. This light and tart Gose-style beer is brewed by the immensely popular, Prairie Artisan Ales in Tulsa, Oklahoma. The Prairie Flare is brewed with orange and coriander and is the perfect beer to pair with a summer salad. Slightly tart, and even a little salty, but with enough citrus to balance the flavor, this refreshing beer would also make a great alternative to a mimosa at brunch. Don’t you just love summer? !